Paintings and drawing done by me, including descriptions of how I go about it, in and around Mauritius. 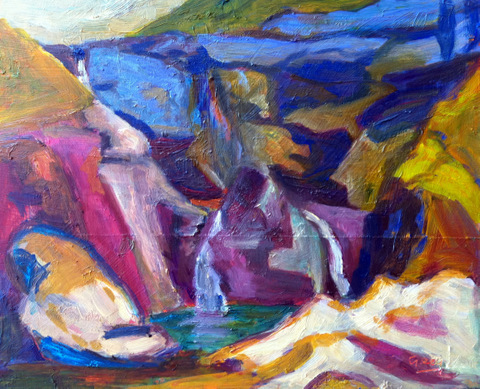 Small Oils 5 x 7, 6 x 8.
viewpoint, I very much wanted to go down to the largest waterfall and see for myself what it looked like. It is important to understand what you are painting/drawing and from far away there were several aspects that puzzled me. I found a guide and arranged to go down. The walk takes 45 minutes and is very treacherous..it is steep and the earth is dry so you can easily slip. These are the paintings I did from my first trip in July 2011. I painted over a canvas I had made exploring 'painting to music'. You can see the shapes underneath. I had traced over this drawing and squared it up, then transferred the sketch onto my large canvas in charcoal. I am careful to fix the charcoal drawing with fixative before painting otherwise your oil paint turns black! We are now in October and I had an urge to go back to the 7 cascades 4th pool as I was now sure that the final large picture of 160 x 120 should be portrait and not landscape, as I had determined that portrait was better for this subject. So I had to go back again to my place and work on a painting 'portrait' style on a 8" x 10" board. This is the painting I made, I only did one that day, I spent 5 1/2 hours all in all, Jerome accompanied me. I forgot my glasses that day! I still wasn't sure what to do next, feeling unsure I phoned Jocelyn Thomasse and I went to paint with him on Friday, took all my sketches and made this painting size 5"x7" from painting above. which I then painted onto a larger canvas 70cm x 80cm there in his studio. I was very happy with the large one as I had subconsciously painted a yellow 'woman' on the right of the picture. When I was lying in the bath, I saw my hips and thought of the rocks at the waterfall. I felt that the rocks were my hips, they had the same form, and now I had painted a woman lying down and that same piece of rock was her HIP!!!!! In fact I feel I am painting myself reflected in the landscape, the landscape is my body. I was reading a book about artist Peter Lanyon who too described this point of finding yourself in the landscape. I feel 'figures' in certain parts of the rocks, and there is a 'lady' on the right in blue. I went back to paint with Jocelyn on Saturday afternoon and took another of my small studies, this is one I did on my first sitting in July (we are now November) 5" x 7"
I then turned my waterfall picture 160x120cm (yellow above) that I had already painted, onto the side so it was portrait and took the last portrait sketch in blue and transferred the main lines onto my canvas and started painting it in roughly. and, after looking again at my red/green sketch and blue/purple pastel I preferred them, the composition was better too, the 'head rock' was lower down, the only thing that troubled me was that it was so 'sketchy' and not so defined. But, I went ahead and changed my picture a third time, retracing the main lines, squared it up, transferred the main lines onto my large canvas to create my 160 x 120cm painting. I like the top one (red/green) because it was one of the last pictures I had done one day down there when I did about 5 works, ranging from watercolours, pencil drawings and paintings. Usually the last one is the 'essence' of the place. So, I worked from this and the other small ones. I had to redraw the picture onto the canvas, this is the third time I restart this large painting! The painting came out very quickly, I felt it was 'right'. I put blue in the background then decided it was too blue so added orange as in the one above. It seemed to work and 'sing' and I finished it in a day. The reason why it works is because it is made up of two complementary colours: red and green. There is yellow in the foreground but that can be counted as a derivative of red-orange. It is fundamentally the 'space' of the place that interests me, the round cave like form in the back of the picture and the round pool in the front. Viewed from above they are circular. I took this from the top of the waterfalls, looking down. This is how painting feels, it feels 'right' when you get it right but you have to work, work, work in the dark for months not knowing where you are going or what will come out of it, until one day, it appears, and you feel 'that's it!' This is the final picture which measure 120cm x 160cm. Somehow, it didn't look very finished, but I've left it like that...It came out really quickly and I felt that was it, it was supposed to look like this..I must accept it for how it is and not try to make it perfect. I mustn't fiddle with it and spoil the impact. Many times we fiddle and overwork our pictures..I've done that far too often. But when I show people it, they like it. They feel the space, which is what I was really taken with in the beginning. I've often read and heard people saying "what was it that really impressed/inspired you and made you WANT to make a painting of this place?" THAT is what you must try to capture. Whether it looks like a pretty picture or if it looks like what I imagined is another thing. We must accept things the way they are, ourselves in fact. We don't always like them but we must appreciate them for the way they are. We must keep things natural and wild, like ourselves.... all this to tell you how I go about making ONE picture, or rather about expressing ONE feeling. In fact, there are many things that make up a picture for me and which I love about painting: adventure, being alone, exploring the wilderness and nature, peace and quiet for hours on end, not seeing another person all the time I'm out painting, being in awe with the landscape, watching the light of the day change rapidly as the sun moves and as the clouds move, working intensely in deep concentration and letting the subconscious speak through the movements of my hand with the paint. Getting that quick quick feeling as your hand moves faster and faster and you paint like a child...not caring just doing it, and the feeling that it's right! It really is a fantastic was of living! It does demand a certain amount of 'getting up and getting organised and kicking yourself out of the door' but the day is so exhilarating afterwards, I always come back exhausted and HAPPY!!! I like being outdoors in wild places, walking and looking! When I see an interesting place I like to paint there with my Pochade box and my oils doing paintings which come from my subconscious. These are emotional reactions to the spirit of the place. Painting on the ring road on Le Morne, Mauritius. Details of my hinge for the cigar box. "Colour is the power which directly influences the soul. Colour is a keyboard. The eyes are the hammers. The soul is the piano with the strings. The artist is the hand which plays, touching one key to another to cause vibrations in the soul"
I feel I'm playing the piano when I paint, my eyes search for rhythm and colour in the landscape and tell my brain what to do...I don't 'think' too much when I paint, I let my subconscious guide me.